Thought Experiment recognizes that even with particle accelerator propulsion systems, interstellar travel will take years (versus days for interplanetary). 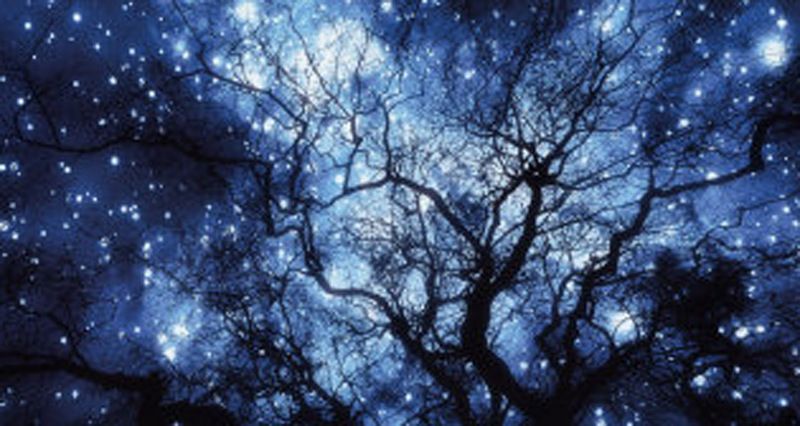 Thus, the interstellar portion of our thought experiment uses better computation methods to determine g-force ranges. Constraint: g-force needed to maintain Earthlike conditions and best environment for human travellers. Need g-force acceleration to attain sufficient portion of light speed to make interstellar flight duration reasonable. (few years). Need g-force deceleration to slow down. However, g-force propulsion requires fuel, and interstellar voyages take so long that a starship would easily consume well over 100% of its mass in fuel during the multi-year voyage. 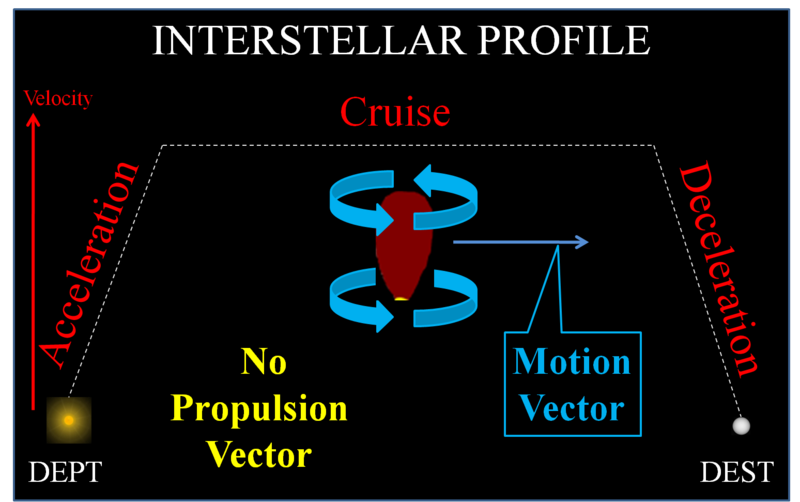 Thus, interstellar flights also need cruise phase constant velocity. No fuel consumption, no g-force; thus, regain g-force through longitudinal spin, and crew/pax lives on inside of outer hull. 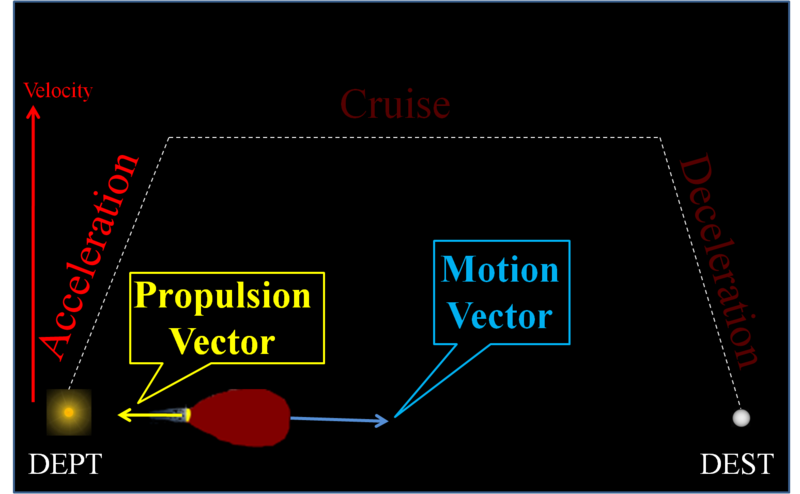 Ship's propulsion system accelerates a predetermined mass of ionized particles (plasma) to exit vehicle at relativistic speeds. Since these ions come from designated, onboard material, this material fuels the spaceship much like gasoline fuels our automobiles. For both vehicles, when we add fuel, the total gross weight (GW) increases; when fuel transforms into energy to produce motion, fuel is consumed, and GW decreases. The fuel is consumed at a certain rate; thus, ship's gross weight (GW) decreases at this same rate. If we know the amount of fuel and the consumption rate; then, we can calculate the time required to consume this amount, the ship's range. TE artificially assumes every single particle travels completely through the many kms of waveguides and exits spacecraft exhaust as intended. TE further assumes no additional energy is required for other energy requirements, such as electro-magnetic fields to guide the particles. Thus, TE artificially assumes 100% efficiency for convenience. Future work will adjust for less then perfect efficiency. Marginal Fuel Requirements - it makes sense to carry "spare fuel"; it's always a good policy to plan the mission to end with some fuel remaining. Since this fuel is not planned for consumption, it might be better to consider marginal fuel as part of ship's infrastructure. Thus, thought experiment disregards spare fuel for computing range of spacecraft. Assume continuous g-force acceleration due to constant particle exhaust speed. TABLE-1 varies fuel loads given just one particle exhaust speed (vExh = .99c) to determine Vessel Ranges based on fuel load. TABLE-2 varies particle exhaust speeds given just one fuel load (F0 = 50% GW0) to determine potential Vessel Ranges based on particle exhaust speed. will increase over 7 times greater due to relativity. TE assumes following g-force values. Since first day of g-force flight takes ship to .2826% c, TE calls that value, Δ "daily difference". 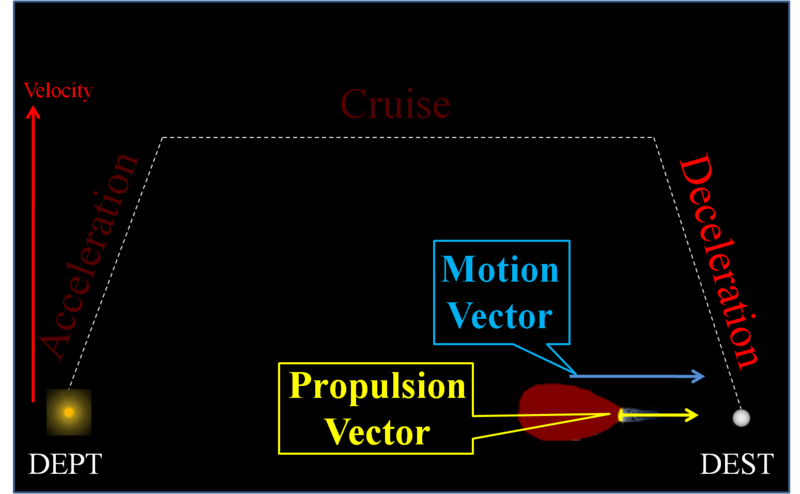 Acceleration brings ship to a near light speed velocity which facilitates a reasonable cruise duration. After our spaceship accelerates at g-force for 1 year, it'll achieve a velocity of .6443 light speed (c) and will have expended perhaps 25% of available fuel. However, total distance for a year of g-force acceleration will still be only about .38 light year (LY), not even close to the Oort Cloud which borders our Solar System at about 1 LY from Sol. 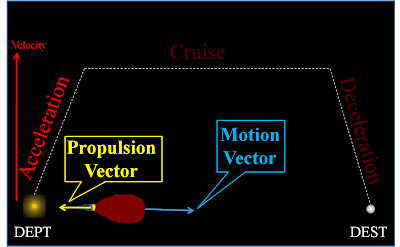 Acceleration Time: Let tAcc = powered flight time to accelerate from departure until cruise phase begins; amount of time available for acceleration depends on vessel's range, propulsion time, tProp. Max velocity is achieved at completion of acceleration phase. ffsec Fuel flow per second determines fuel consumption; thus, ever decreasing gross weight of g-force vessel. For every second of flight, our notional spaceship consumes a quantity of "at rest" fuel which we'll call fuel flow per sec (ffsec). This is the fuel's mass prior to conversion to plasma (ions, particles with charges). Fuel consumption is reckoned in terms of fuel at rest "ffsec" which is at zero velocity in relation to its host vessel. "At rest" fuel gives the daily difference in gross weight (∇, a certain gross weight percentage decrease per day). ffExh Fuel exhaust mass provides propulsion for g-force vessel. For every second of flight, a particle accelerator uses a system of magnetic and electrical fields to accelerate these charged particles to large fraction of light speed. Relativism and a century of particle accelerator experience both tell us that ffsec will grow as particles accelerate to near light speed; we call this new quantity ffExh, fuel flow of exhaust particles. Collective exhaust particle momentum (near light speed velocity times relativistic mass) enables spaceship's propulsion. To account for relativistic growth, TE uses relativistic mass growth factor, mr; this is computed with Lorentz Transform (LT). To state this exhaust rate, TE borrows the symbol, ∇ ("nabla"), and uses it to represent percentage of ship's gross weight consumed each day, the "daily difference". Relativistic mass increase can be expressed. Lorentz Transform shows that relativity growth factor causes exhaust particle mass to grow about 7 times. If ship's initial gross weight (GW0) is 100 metric Tonnes (mT); then, ship will consume .04 mT of fuel on first day of powered flight. Deceleration phase values will essentially equal corresponding acceleration values. Assume we devote half of ship's mass to fuel; (%TOGW = 50%). Then, ship starts with 50 tons of fuel, and a we can initially approximate ship's propulsion range by dividing 50 mT by .04 mT (= 1,250 days). However, previous work reminds us this is only a rough approximation, and that we need more accurate methods. (For example, an upcoming "Half Life Method" uses logarithms to more accurately and quickly determine vessel range. The initial absolute consumption value of FDay ( = ∇ * GW0) is a good approximation for first day of flight. After the first day, we must consider that GW decreases as the fuel is consumed. Thus, Δ, as a daily dynamic percentage value, reflects the ever decreasing GW during powered flight. Interstellar flights will need a lengthy constant velocity duration to conserve fuel. This profile assumes a cruise phase at .6443c for several years. No prop vector, no prop time. 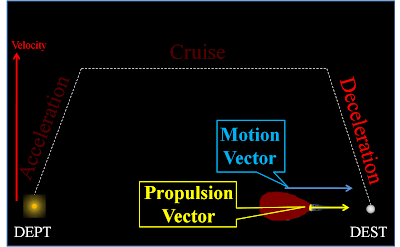 Cruise distance will be the remainder of the distance to destination after deducting acceleration distance and deceleration distance. Cruise Velocity is max velocity achieved at completion of acceleration. 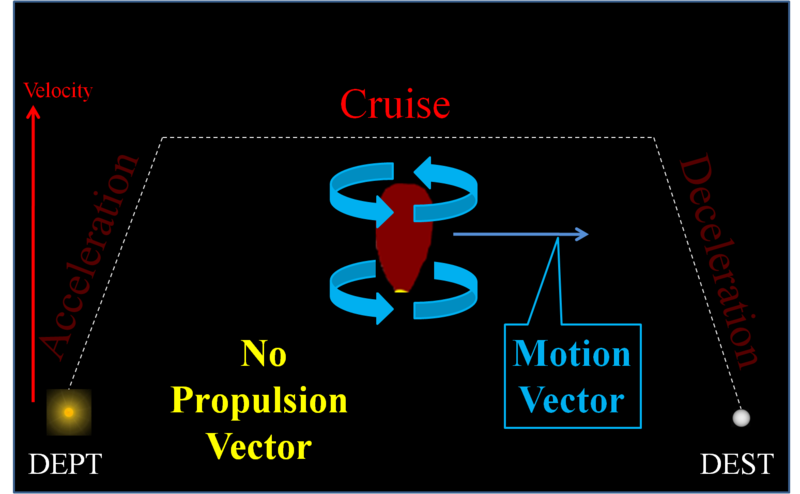 With no propulsive force applied, ship maintains this velocity throughout cruise phase and consumes no fuel. 1st day of trip, GW1 = GW0 - first day's fuel consumption = 99.96 tons. 2nd day, ship consumes .o4% of the remainder which will be less then .04 mT. On day, t, fuel consumption will be even less and so on as shown in following table. To daily decrement 1% of ship's gross weight (GWt), multiply original quantity (GWo), by (1-∇) as shown. Ship's GW decrements by percent not by absolute weight. Departure leg, the flight from our home sun, Sol, to a neighboring stellar system, will also consist of three phases: acceleration, cruise and deceleration. However, only the acceleration and deceleration phases use propulsive force and need to be included in range considerations. Vessel's Range for Powered flight can be divided into four equal parts. Considering the acceleration time equals deceleration time for each leg, and each leg's time equals the other; max acceleration time equals .25 times the vessel's range. Original Fuel Load: Thought Experiment now assumes no enroute refueling; thus, original fuel load, F0, at start of flight is all the fuel available to accomplish all the g-force travel for departure leg and return leg Thus, fuel consumption of F0 gives us our range. DeptAcc: During this duration, spaceship attains an enormous velocity, vMax. Exponentials can readily approximate fuel consumption. Any inexpensive scientific calculator has an exponent function; thus, we can readily calculate numerous guesses as to how many days is required to reduce ship's original gross weight (GW0) by 50%. Consider that as fuel is consumed, GW decreases; thus, a lesser GW needs less fuel to propel it, and this cycle continues throughout powered flight. Thus, fuel consumption decreases throughout flight even though the GWDay percentage remains the same for consistent propulsion throughout powered flight. Recall that TE previously guessed a vessel range of 1,250 days of powered flight (because 50% divided by .04% gives us 1,250). However, a quick exponential calculation shows that 1,250 days of .04% consumption reduces ship's gross weight to only about 60% of ship's orginal gross weight (GW0). we eventually determine t integer which produces a value much closer to 50%. Thus, we determine that at .04% GW consumption per day; 1,730 days takes us very close to 50% of original mass. Thus, an initial fuel load of TOGW = 50% and a ∇ of .04%/day gives our notional spaceship a range of about 1,700 days of powered flight. Return leg: the flight from the destination back to Sol, can have a range of values which don't necessarily equal the phase values of the departure leg. However, for convenience, this chapter assumes corresponding phases to have equal values. Thus, the acceleration time of the Departure leg equals the deceleration time of the return leg and so on. RetAcc: Accelerating back from destination to maximum velocity at the beginning of the Return Leg's cruise phase. Return time can differ from Departure time, but for convenience, TE assumes the two durations to be equal. RetDec: From cruise phase, decelerate from max velocity back to trip's original departure point. Acceleration Time, tAcc We've already determined range based on original fuel load, F0, (possible range in time (days) from %TOGW and GWFin; see above table). There might be a more graceful way to determine this range. A more convenient method might use logarithms. Thus, logarithms can quickly approximate range for different Fuel Loads. This is shown in Table-1. is fuel mass needed for powered spacecraft flight. This includes acceleration & deceleration phases (but not cruise phase). Since spare fuel is not planned to burn, TE considers it part of the ship's infrastructure and not part of F0. F0 can be expressed as a percentage of original gross weight (GW0). is ship's gross weight (GW) after t days of powered flight. is ship's initial gross weight (zero days of powered flight). It includes ship structure, payload, passengers, crew and original fuel, F0. Planned days of g-force powered flight time includes durations for acceleration and deceleration but not cruise time. Term "half life" means a duration for which a specified shrinking substance decreases by 50%. Shrinking could be due to radioactivity like thorium or uranium; or it could be due to fuel consumption like automobiles, aircraft or g-force spacecraft. For example, radioactive thorium might decrease by 50% in 60 seconds. This could be described by Mtho(1-Δ)t = .5 * Mtho where Δ is % difference in mass per second and the t is time in seconds. Percent Initial Gross Weight (%GW0) is the amount of fuel required for entire mission. This value is expressed as a percentage of the vessels' initial gross weight, GW0. Since current particle accelerators now accelerate particles to faster then .99c, it's certainly possible that we'll eventually design propulsion systems to accelerate particles that fast and even faster. We've previously shown that faster exhaust particles lead to much slower fuel consumption and consequently much greater range. This greatly extends range of g-force spacecraft. mr is relativity growth factor computed from Lorentz Transform. dc is decimal component of particle exhaust speed when expressed as decimal light speed. ∇, "daily difference", is the amount of fuel needed for each day's propulsion, expressed as a percentage of ship's gross weight (%GW). Δ , "daily delta", is percentage of light speed achieved after first day of g-force flight. tP is total powered flight time; this is also known as the "range". vMaxis velocity achieved after g-force acceleration for tAcc days. c = 173.15 AU/day. dAcc is acceleration distance. 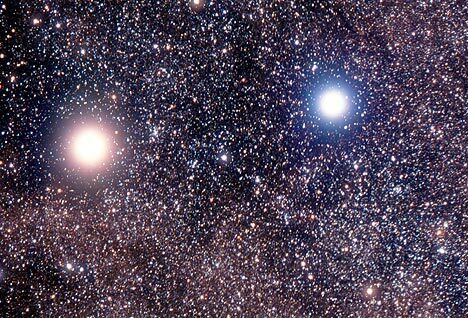 1 light year (LY) = 63,241 AU. dP is total distance for powered portion of flight for both destination and return flights. This includes distances for acceleration and deceleration (but not cruise). TE assumes ever improving technology will lead to higher performance, higher efficiency g-force propulsion systems such that particle exhaust speed will keep increasings. Ever increasing particle speed and system efficiencies will lead to ever shrinking ∇ s, daily increment of %GW needed to maintain g-force. Leads to greater vessel range; i.e., available propulsion time, tP. As duration increases, radioactivity decreases remaining mass of certain elements. As number of days of g-force flight increase, fuel consumption decreases ship's mass. ...easily computed with logarithms. ...easily computed with logarithms. Portion of tP actually used for propulsion; that portion divided by 4 to determine acceleration time, tAcc . Recall tAcc is g-force duration from beginning of flight to start of cruise phase. The longer the initial g-force duration, the higher velocity achieved, the shorter the cruise phase. At completion of curise phase, an equal duration is required to decelerate to destination. These three phases compose the departure leg (acceleration, cruise, deceleration); only the acceleration and deceleration phases required g-force power. Similarly, return leg requires same three phases, and TE assumes their durations equal corresponding departure phase. Thus, there are four g-force durations, each of them = initial tAcc. ...interstellar travel constant acceleration (Erika Fani: heroine concordia)... cruise-ship "Costa Concordia", wreck: from the heroic crew who stayed to the rescue of passengers, remember that Young Heroine with 25 years of the crew who yielded her life-jacket to an old passenger, the "man" old passenger was salvaged, and not Erika. Remain Immortal forever the memory of that Young Heroine: Honor and Glory Eternals.